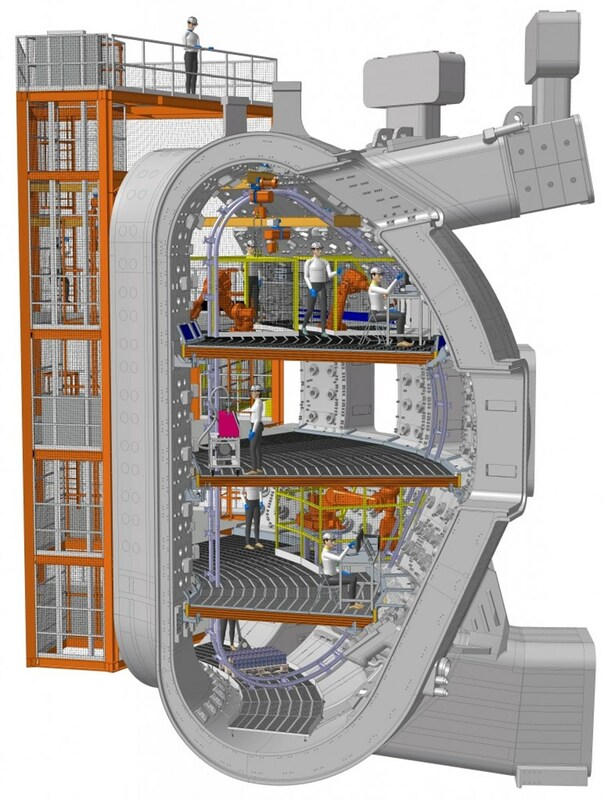 In order to accommodate the dozens of teams that will be involved with assembly tasks on the inside of the vacuum chamber, the ITER Organization has designed a modular staging kit that can be installed—and easily uninstalled—in ever-changing combinations. Modular platforms at four levels will provide the access teams need to perform in-vessel installation activities. As a highly adaptable modular structure, the staging can be broken down into 10-degree sections to allow for the movement of in-vessel cranes and other handling tools. The staging will provide a robust platform as technicians carry out such in-vessel assembly tasks as the welding of vacuum vessel sector joints; the fitting of cables and components for diagnostics and instrumentation; the mounting of blanket modules; and the attachment of cooling pipes and in-vessel magnet coils. Four levels of aluminum staging inside the vacuum vessel will provide floor space of roughly 550 square metres. Within the considerable volume of the torus—seven metres wide at its broadest point and over ten metres tall from floor to ceiling—four levels of platform-type staging are planned to allow near-arm's-length access to all interior surfaces. The design has been the biggest challenge," says assembly tooling engineer John Oldfield. "We had to combine the requirement for quick and easy installation and removal of the staging with the necessary sturdiness to support workers, machinery and materials. Operators must be able to handle all elements of the staging platforms manually." The solution is aluminum staging that is safe, lightweight, modular and adaptable to vacuum vessel tolerances. The heaviest single element is a beam weighing about 50 kilograms that can be manipulated by two or three workers; otherwise, the staging sections are light enough for operators to install them overhead as they construct the staging structure from the bottom up. 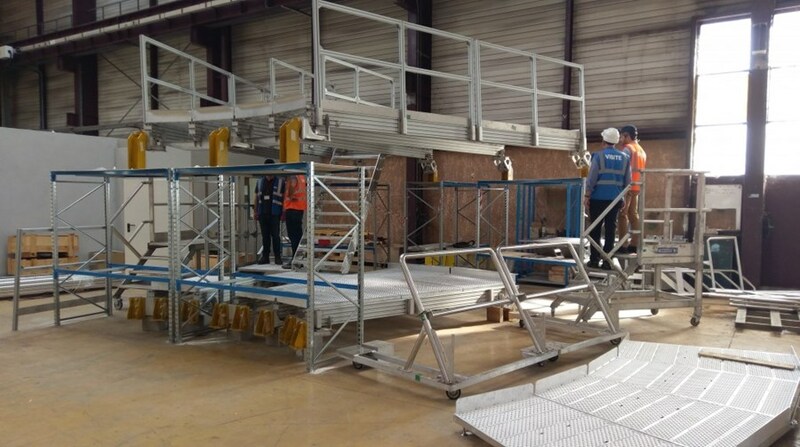 Trials took place last year at CNIM, near Toulon, France, on a prototype that reproduces 40-degree sections of staging at three levels, complete with adjustable floor elements, workstations and moveable barriers. "This prototype helped to demonstrate functionality, fit and ease-of-handling during assembly sequences," says Oldfield. A staging prototype at CNIM was used to test functionality, fit and ease-of-handling. Full testing of the staging will take place in the Trial Test and Training Facility, which is under construction now. As a next step, CNIM is constructing a full-scale Trial Test and Training Facility (TTTF), to create a realistic representation of all the important structural features of the work environment inside the vacuum vessel from an engineering point of view. The test facility will reproduce three full-scale sectors of the vacuum vessel (120˚), equatorial ports and port cells, and all access platforms and staging in order to trial mechanical handling equipment and perform full tests on the staging. Operators will have the opportunity to hone their skills at assembling and de-assembling the elements quickly and in a confined space.